In the last two newsletters I’ve covered both mula and uddiyana bandhas from an anatomical point of view. I feel the need to finish off these two articles with one on the breath. The diaphragm is shaped like a parachute. My teacher John Scott directed me to my first personal and direct experience of the connection between breath and bandha. At the point when I met John, I had been practicing Ashtanga Yoga for about one and a half years. I was in the UK to teach anatomy workshops for the very first time and I had booked on to study Ashtanga Yoga with John for two weeks. At the end of the first week John said to me something like, “David, you’ve shown up with a full primary series, but no breath and no bandha.” Needless to say I was crestfallen. At that point I thought I understood what breath and bandha where. To be honest I might have intellectually known what they were, but I hadn’t experienced them in the way that John was talking about. John is not the type to make a comment like that and then not show or explain what he’s talking about. Occasionally you find teachers who flippantly say that you can’t do this or that pose because you don’t have bandhas, but then they don’t show or explain what they mean. John sat down next to me and put my hand on his abdomen while he was breathing and I continued to hold it there while he did a few different types of asana. Whatever I had been doing, it wasn’t what John had done in that moment. I had one more week of practice with John and then I was headed home, at which time I gave every ounce of my effort to holding my navel in the way John had. I purposely did not focus on the asanas’ depth, only on whether or not I could breath correctly while holding my navel in, in the same way I had witnessed John do it. Over the course of the following three months, practicing six days a week, I slowly started to understand. The breath led me to understanding bandha and slowly but surely there was a lightness and ease to my practice that I hadn’t experienced before that. There is plenty of debate about what the “right” type of breathing is in yoga. The more classical yoga practices such as Sivananda use a belly breath; those of us doing a more vigorous ashtanga type practice keep the belly in during breathing. Other methods don’t really pay attention to the breath at all. I must acknowledge that because I’m an ashtanga practitioner my experience and understanding at this point is colored by that method. That’s not to say that the way it’s done in ashtanga is the “right” way. I see it as a technique to elicit qualities in the practice. Now, my job is to make this anatomical in some way, which I will do in short order. First, as a reminder from the last two articles, mula bandha refers to the root lock, which is associated with the pelvic floor. Its purpose is to prevent the downward flow and escape of energy through the bottom of our torso. Uddiyana bandha is translated as “upward flying” and is the energetic lock that is responsible for creating upward moving energy as well as the lightness we see in an advanced yogi’s practice. In those last two articles we associated mula bandha with the pubococcygeal muscles and uddiyana bandha with the psoas muscle. The main muscle of respiration as many people know is the diaphragm. 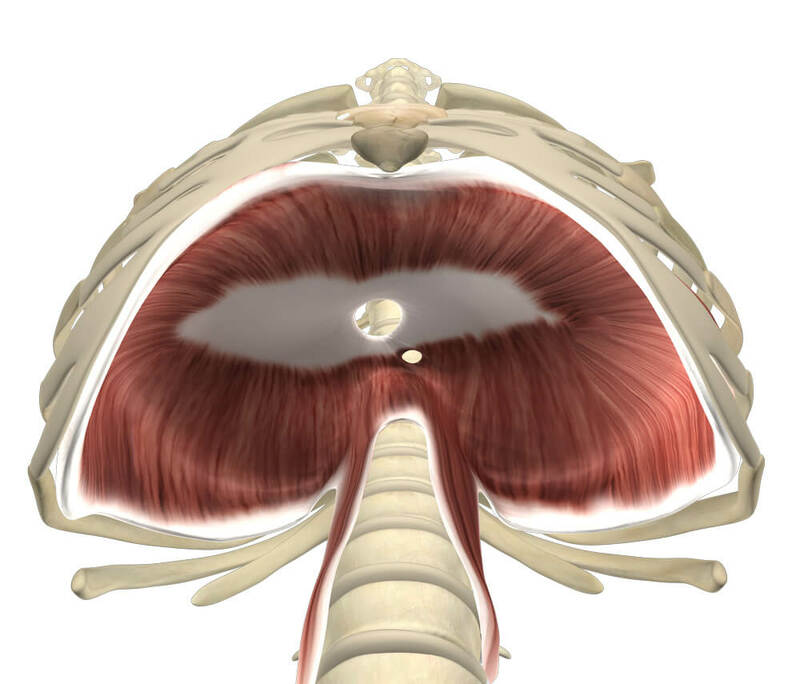 The diaphragm is a muscle with a shape unlike any other in the body. I often refer to it as dome-shaped. The image I provided with this article (which came off the web) refers to it like a parachute. As far as attachments of a muscle go, the diaphragm stands alone. Most muscles attach from one bone to another and then moves those bones relative to one another. The diaphragm is a little different. 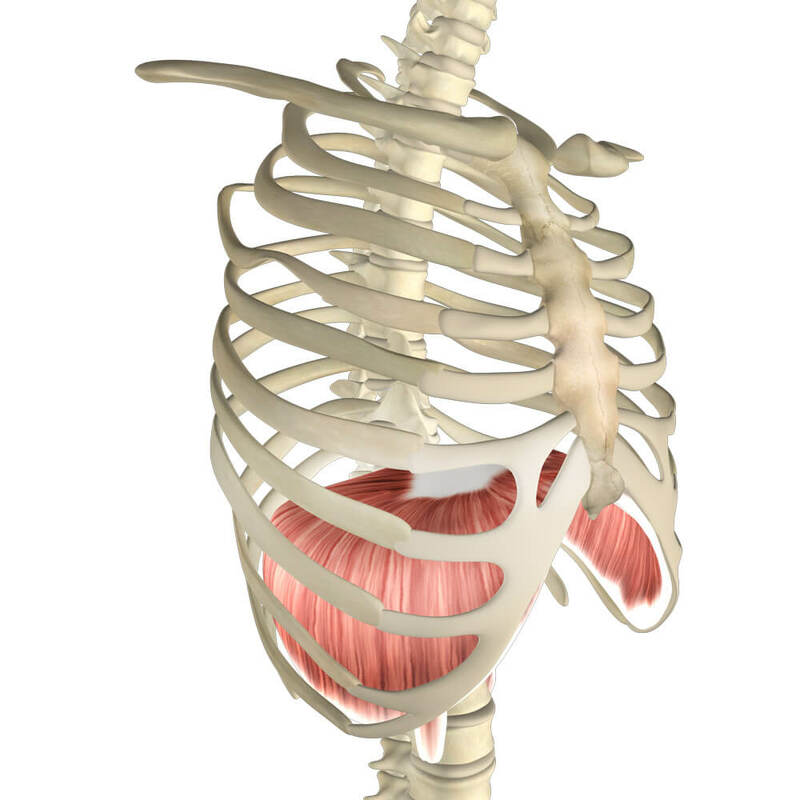 The posterior part of the diaphragm attaches on the spine and then it circles around the bottom of the rib cage until it gets to the xiphoid process at the bottom of our breast-bone. The fibers of the muscle run up and down and attach at the top of the dome to what’s called the central tendon. When the muscle contracts it shortens those fibers and one end moves toward the other. There are two ways that the diaphragm function. Those functions relate to whether we breathe into our belly or into our chest. They are also the key to the relationship between how mula and uddiyana function anatomically and the physical effect they create in our torso. The first way of breathing we’re going to talk about is the way that everyone believes is the biggest deepest breath, often referred to as a belly breath. In this kind of breath it’s common for people to think that their diaphragm moves down between 3 and 6 inches and therefore forces the abdomen to push out almost the same. As much as it might feel like this, it isn’t happening. On our biggest belly breath the top of the diaphragm is probably moving downward between 1.25 and 1.75 inches. (see references below.) There is variation based on height and weight. This will seem obvious when I tell you that the heart is sitting on top of and is connected to the diaphragm via connective tissue. If the diaphragm moved down that far, what would happen to the heart? You don’t really think your heart is going to move down between 3 – 6 inches when you breathe, do you? 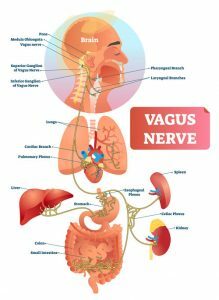 Now, with this first way of breathing the diaphragm contracts and as its surface moves down, it pulls on the connective tissue bags that surround the lungs. As a result of this, a negative pressure is created in the chest cavity and the lungs fill. It is the diaphragm moving, even just an inch that pushes the abdominal contents below and the abdomen out. The second type of breathing is different and it changes the sequence of events that happen when one breathes. In the first type of breathing (take a couple with your abdomen moving out), the abdomen pushes out on the inhalation first and then toward the end of the breath the chest fills. In addition at the very end of inhalation you may also find that you feel a slight pressure on your pelvic floor as it stretches or is pressed down by the abdominal contents. The second type of breathing causes the diaphragm to work in a completely different way. In order to make this happen we have to do a couple of things. We have to change the tension in different areas of the abdominal container. By abdominal container, I mean the container created by the diaphragm on top, the pelvic floor on the bottom, and the abdominal muscles around the side and front. There are two ways in which we change the tension in the container. The first one is to contract the pelvic floor muscles. The tightening of the pelvic floor means that when pressure comes down from the diaphragm contracting, that pressure won’t push those tissues downward, because the tension prevents it. This of course is the purpose of mula bandha, to prevent the downward movement of energy. The second way in which we change the tension in the container is to pull the navel in and hold it there during both inhalation and more easily during exhalation. If you also hold the abdomen in and take a breath, you will quickly notice that the breath goes into the chest right away. The diaphragm no longer has the ability to push down and the abdomen obviously can’t go out. The force gets re-directed upward into the chest. Isn’t this the purpose of uddiyana? That is, to direct the energy/breath/prana upward? This represents the second way in which we can breathe. By holding the abdomen in, the diaphragm is forced to produce a different action. Instead of the top of the diaphragm moving downward as it did in the first type of breath, the top of the diaphragm remains still. With the top of the diaphragm remaining still, it’s obviously not going to lower down. Instead, the fibers of the diaphragm pull the lowest ribs upward. Keep in mind that the ribs in our chest are not parallel to the floor. Instead they are angled down. As the diaphragm contracts in this way, the front of the ribs lifts upward once again making space in the chest cavity (just in a different way). With the space made, negative pressure is created and air rushes in. Let’s recap. If you do nothing but take a big breath, the abdomen and pelvic floor (to a much lesser degree) get pressed outward. If you put a bit of tension into the pelvic floor and the abdomen, preventing them from going out as one does when applying mula and uddiyana bandha, then the diaphragm functions differently and the breath is re-directed upward. This is in essence the purpose of the bandha. This type of breathing stimulates their deeper and subtler aspects as energetic components for practice. This is not a critique or judgment about which way of breathing during yoga is correct. Both are correct depending on the method one practices. What I am saying is that the technique of physically creating mula and uddiyana during an asana practice changes the way in which our breathing happens, physically. That physical change is in line with the intention of mula and uddiyana. You can read more about the connection between breath and bandha on pages 158-161 of my book Functional Anatomy of Yoga. Gerscovich, E. O. et al. 2001. Ultrasonographic evaluation of diaphragmatic motion. J Ultrasound Med 20:597–604. Cohen E. et al. 1994. Excursion-volume relation of the right hemidiaphragm measured by ultrasonography and respiratory airflow measurements. Thorax. 29:885-889. Can’t help but wonder what the statistics are for people who have spent their entire lives breathing in this fashion (natural bandha holders’), from a health and fitness standpoint, as opposed to the, more common, belly-breathers. Good question Steve… Not sure what those statistics would be. Personally I wouldn’t expect many people to breath like that. I think we often confuse belly breathing with diaphragmatic breathing and chest breathing with non-diaphragmatic breathing. We then say something to the effect of belly breathing good and chest breathing bad. In reality, both utilize the diaphragm. The bad part is when the diaphragm is not functioning as the primary respiratory muscle and the secondary ones, including some anterior neck muscles and even intercostals have to do the work of the primary muscles. This leads to what I think everyone is concerned about which is a lack of oxygen in the body. Which of course, would not be good at all! Hopefully we’re using what I describe as a technique for a practice and then letting it go the rest of the day, right? Thanks for your reply, and more food for thought. In the Ashtanga yoga system, I have often heard that bandhas should, in the perfect world, be set at all times. As an anatomist, do you think this viewpoint is mis-leading and/or potentially unhealthy or, one of those unreachable ideals? Just to explain the thinking behind my initial comment; My, potentially confused mind, processed that piece of info., (that bandhas should be set all day), alongside your article and thought “hey, this could be a new, and healthier way to breathe”. This led me to thinking, possibly wrongly, that some people may have had that style of breathing by default (you will have sussed by now, that I am way, way short of being an anatomist, so this may be quite wrong!). Just for the record, I didn’t find your article mis-leading at all, but maybe combining it with what I had heard about bandha did add an element of confusion. I better understand your perspective and question. bandhas on while practicing… NOT whole day. It is totally realistic to maintain bandhas through the whole practice. People often forget that the breathing in Ashtanga is a technique… in essence a pranayama to be done while practicing but with no breath retention (kumbhaka). I would suggest, not trying to change the way you or anyone breathes through the whole of their day. People breathe differently for different reasons and messing with it can have negative repercussions if one doesn’t know how to handle the changes that may come. Not that you were suggesting this, just as a note for everyone in general. Great post. My teacher is always tapping me in my stomach for an adjustments. It’s really the foundation of the entire practice. Great article. I’m fairly new to Ashtanga and I’m trying to incorporate the bandhas and the breathing techniques but since I’m learning I develop a bit of tension. One main problem is on the exhale. It feels like my lungs don’t empty fully without some extra effort when the bandhas are engaged. David Swenson advises a slight abdominal contraction to help with this. Any input? Since you’re new to practice, I would suggest that you simply keep exploring these ideas. It all changes over time anyway. I’m not sure that there is a rule that says all air must be pushed out on every exhale. Focus on controlled inhale/exhale and try to make them sound the same and be the same length. 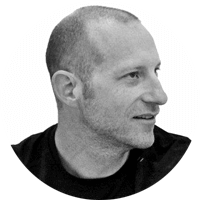 Thanks for the information, the way it is all explained is very useful in linking together these two essential components of the practice (breathing and bandhas). My personal view on this topic is that one must always search for an ideal balance between correct technique/execution and comfort. If breathing feels uncomfortable in any way, it probably needs some adjustment in the way of better focus. I believe that the process in reaching correct application of these principles rests is being aware of how they gradually develop in the day-to-day practice. I imagine that’s one of the reasons Ashtanga Vinyasa is traditionally practiced six days a week, and also an explanation to why it is important to practice the set of series as they are. When one focuses solely on reaching alignment in asana, one may incur in reducing attention on the more subtle, energetic part of the practice. When one focuses on all the main principles of the Ashtanga Vinyasa system into the practice, it is very easy to realize that it takes consistent involvement through the repetition of the series to achieve a fully integrated technique. That is one of the challenges I enjoy the most of this method of practice- facing the same obstacles as a totally different experience… Every day! Btw I have a question. Is engaging the bandhas while breathing only applied to the asana practice, or is it applicable to pranayama and meditation practice as well? 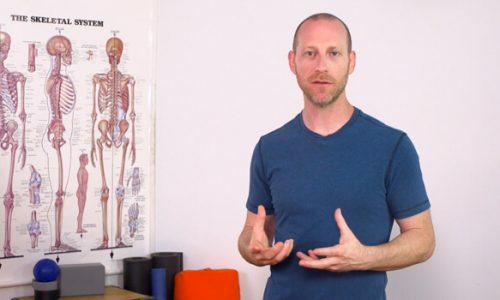 I engage them on all three practices, and find it to aid in the depth of concentration once one gets a hang of it, but I’d like to know if it is considered a proper way to practice from an anatomical POV. Well written, thanks for offering your knowledge. David, what a great article! What is your experience with the breath once you have created the abdominal container, establishing mula bandha and then developing an activation of both serratus posterior (inferior and superior) to lengthen the chest, pectoralis minor to assist the opening of the chest, and serratus anterior to establish the wings into the chest? 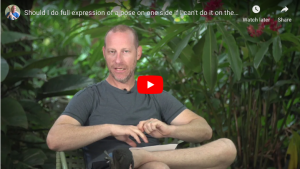 I know that’s an anatomical mouthful but I find this to be the ideal posture for pranayama practice and being able to breath deeply while stabilizing the spine. If we just move the navel inwards the capacity of the lungs is not reaching potential. Any thoughts? Thanks for adding your thoughts and comments. What you describe sounds like a good idea. I don’t usually get as anatomically specific when teaching breathing technique. Instead I just direct people to breath into certain areas that usually go missing. My assumption is that the muscles that need to work will, if not at first than over time. As for navel in and lungs reaching potential… I agree. Just bringing the navel in doesn’t assure full lung capacity, it’s just a technique to stimulate and head toward an understanding of bandha. How does one measure full lung capacity anyway? Also I would suggest that you also have to look at both sides of the equation. Not just what muscles you active to breath with, but what tissues restrict your ability to breath fully. Really interesting article. It is so easy to just repeat what teachers have told you but not really understand what is going on with the breath. With Viloma breathing I typically hear on the inhale fill the belly with the breath, then bring in more breath into the ribs then finally breath up into the chest. But if the breath comes in first through the nose, down the throat and into the lungs would we fill the chest first, then the rib area and the belly last? (Even though the belly does not actually fill with the breath). Also would you say that holding the belly in with the bandhas is a more advanced practice and for beginner and maybe even intermediate students this could lead to not getting a full breath as you mentioned in your article? Fascinating things to think about. It is good to know what’s literally going on, but that doesn’t necessarily make statements such as “fill the belly with the breath” wrong. I refer to this as the more felt-sense instruction as opposed to the literal. In the end, when instructing students, the words that get them to do what you want are the right ones to use. The belly fills first because in that scenario the diaphragm is moving down and pressing the abdominal contents, so the belly actually does move before the ribs. Holding the belly in reverses this by not allowing the abdomen to push out first. It’s a technique and I’m not sure that it is that much more advanced, but perhaps less comfortable for beginners. It all depends on what you want the outcome to be. You might find this article interesting as it talks about the changes that occur when we hold our abdomen in. Your comment ” In fact, on our biggest belly breath the top of the diaphragm isn’t moving down much more than an inch, if that much.” is incorrect as is your rationale for arriving at your conclusion. This flawed logic is common in your blog in other areas as well (like the knee in lotus) and seems to be based primarily on your speculation. This makes me question whether you really know anatomy or have actually researched it (beyond being recruited to teach a bit at the place you studied massage). Here’s a link to a well researched blog written by a physician that explains belly breathing properly and using actual research and not speculation. Are you supposed to the bhandas after in- or exhale or both? If yes what’s the difference?